So here's a little Monday sunshine to brighten what's hopefully already a sunny day. These bits and pieces with their pops of yellow, shades of cork and straw and inky contrasts all work so beautifully to evoke the feel of summer and sun. I love this off the shoulder top from J. Crew. It's happy shade of yellow would put a smile on anybody's face. I love it paired with navy blue and offset by gold and neutrals. Actually, I dare say gold is a gorgeous neutral in its own right! 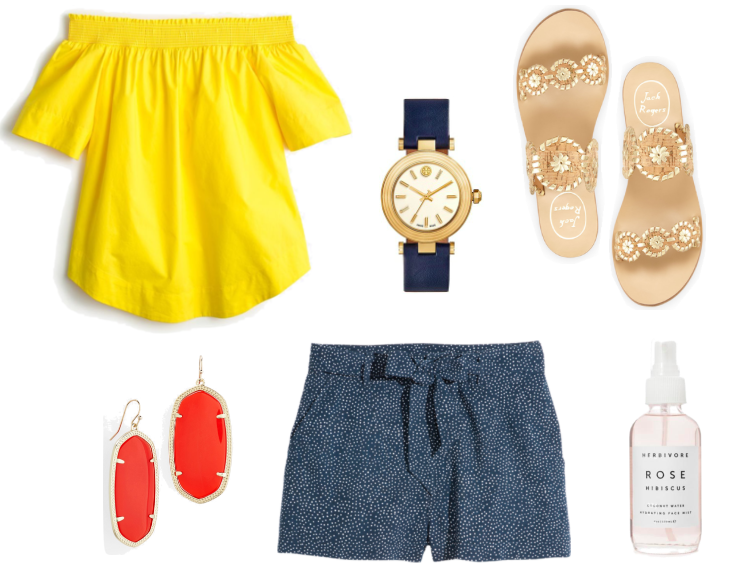 These Jack Rogers sandals are on repeat in my closet all summer long. They're easy, they're classic and they go with absolutely everything I own, haha. This swimsuit has totally caught my eye but then again, does Mara Hoffman ever get it wrong? Don't forget the practicality of a pretty straw tote. As you likely know, I've been coveting several lately and this one is today's favorite. I hope you all got in on the tons of amazing sales that were going on this weekend. Speaking of sales, be sure to stop by Nordstrom for your chance to get your free money to spend at the upcoming mama of all sales, the Nordstrom Anniversary SALE. Trust me, I've scored some of my very best preseason purchases (ever) at this one. You do not want to miss it! Have a great Monday everyone!